Clive Barker. You may have heard his name from the many fantasy/horror books and movies for adults he’s either directed, produced, or written. I’m referring to titles like Hellraiser and Books of Blood. My first reaction when picking up this novel more than ten years ago was: Clive Barker wrote a book for kids? Hide it now before some poor child gets his hands on this nightmarish horror. Curious to read for myself, I immediately fell in love with this fable about 10-year-old Harvey Swick. It quickly became a classroom favorite read-aloud. Various images have graced the book jacket over the years, but the story inside is the same. Harvey has the same problem many kids face during the time after the holidays when January slowly turns into February. It’s called boredom. He finds hope when invited to a magical place known as the Holiday House. He discovers a much different world than the one he left behind where two loving parents are wondering why Harvey never returned from school. At the Holiday House, each season is experienced every day. That means Spring turns into the joys of summer, followed by Halloween (trick or treating every night! ), and Christmas at midnight. Some kids have loads of gifts lining the wall of their rooms signalling they’ve been there more than just a day. Soon though Harvey discovers that a world lacking of boredom has hidden secrets and now he must find a way to escape and return to a life that might not seem so boring anymore. The first paragraph introduces in a fine way what lies ahead: The great gray beast of February had eaten Harvey Swick alive. Here he was, buried in the belly of that smothering month, wondering if he would ever find his way out through the cold coils that lay between here and Easter. Clive Barker never wrote another book for children. I guess why bother when you achieved perfection the first time out. There is a price to be paid, of course, but young Harvey Swick, bored with his life and beguiled by Mr. Hood’s wonders, does not stop to consider the consequences. It is only when the House shows it’s darker face — when Harvey discovers the pitiful creatures that dwell in its shadows — that he comes to doubt Mr. Hood’s philanthropy. The book will appeal not only to 8-12 year old children but also adults who remember those times of boredom. Those times we wish a little more of these days. Some scenes are horrifying but far less than what you might see on early evening television these days. 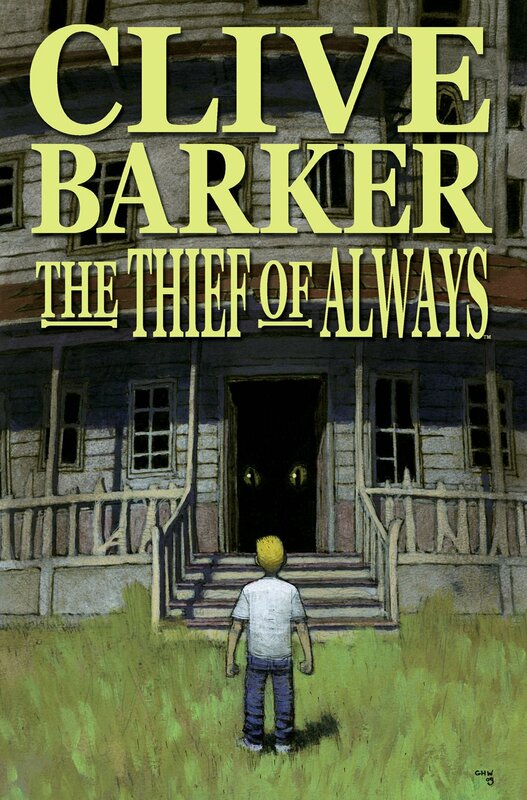 Mr. Barker has written a story that won’t be nightmare inducing but certainly thought provoking. After reading the first chapter out loud, I’ve had reluctant readers take it home and read the rest in one night. You can only imagine the shocked look on their parents’ faces. You’ll find lessons in plot structure here with perfectly refined climaxes, tension, suspicion, conflict, and heroism all rolled up into one fine story. No sequel needed here. THE THIEF OF ALWAYS covers all the bases. 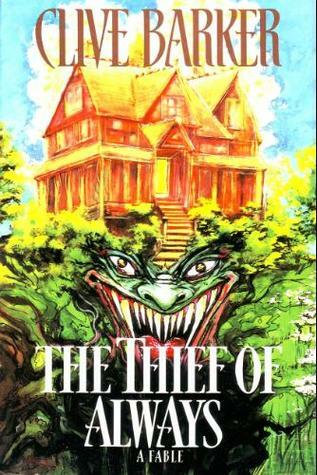 The Thief of Always was Clive’s first published novel for all ages. He called it a fable and the story is very much a fairy tale, illustrated with Clive’s own pen and ink drawings. 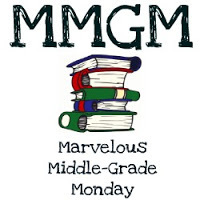 This entry was posted in Reviews and tagged Clive Barker, male protagonists, Marvelous Middle Grade Monday, MG book reviews, MG Halloween reads, Middle grade, The Thief of Always. Bookmark the permalink. What a unique premise. And interesting Clive only wrote one middle grade novel. I had never heard of this book. Thanks for telling me about it. I will definitely check it out. ABARAT from 2002 (the only Clive Barker book I’ve ever read) and its sequels, were aimed primarily at teens. And I found that first book exceedingly weird. Like The Wizard of Oz on crack. 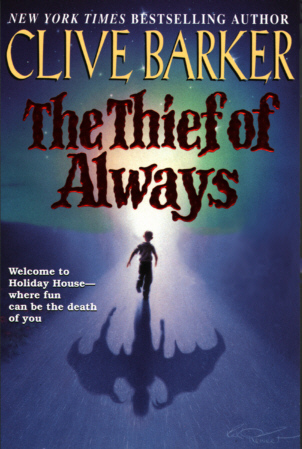 I think it scared me off reading The Thief of Always, but you make a great case for the book! I especially like that there’s no sequel needed. What an intriguing premise and plot for a book. I’ve never read Clive Barker. I enjoyed reading why you enjoyed the book. Does sound like a good book for reluctant readers as well as parents! Nice choice!